American International College (AIC) has signed articulation agreements with Holyoke Community College (HCC), Springfield Technical Community College (STCC), and Capital Community College (CCC) in Hartford, CT. It is a benefit to students to know that the courses they take at the community college level can be transferred to our four-year institution. American International College (AIC) has signed articulation agreements with Holyoke Community College (HCC), Springfield Technical Community College (STCC), and Capital Community College (CCC) in Hartford, CT. Articulation agreements formally partner programs between two-year colleges and four-year institutions. This accord between American International College and Holyoke Community College, Springfield Technical Community College and Capital Community College align courses and programs that will allow qualified candidates to make a smooth, successful transfer from these community colleges to AIC. 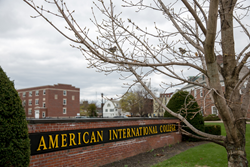 More information about American International College’s Direct Connect program and other undergraduate, and graduate degree programs can be found online at http://www.aic.edu.